4-year-old Holistic Remedy is dead after breaking down in the 1st last night at Mountaineer. After reporting the death on his Twitter feed, track announcer Peter Berry added, “You never get used to it. I always want to turn off the microphone out of respect and let them run home in silence.” But it’s a sport, right? Incidentally, in the same race, Well Done Son was reported by Equibase as “hit fallen rival, fell, vanned off.” The 6-year-old gelding arrived at Mountaineer on a streak of 13 straight claiming races – at bottom-of-the-barrel tracks, no less – with finishes of 5th or below. Dead, as you read? Good bet. Dear Patrick and committed readers: We would love to scroll on by some mornings, save ourselves from the reopening of our own personal response t the news of another innocent dying for sport, money, ignorance – call it what you will. But as long as Patrick puts himself on the line everyday to open his heart to the grisly consequences of this fatal exploitation, I will witness. Like a pebble in the pond, there are days I see your blog mentioned or linked into conversations – educating others and sometimes awakening others to the torture of these sentien beings. Thank you, janwindsong – I agree. “We must see with our eyes what they’ve been made to endure with their bodies.” Racing supporters deny and deny and deny. Cowards, every one. Can you imagine that grisly scene?…the bay colt Holistic Remedy breaking down – injured – and falling…then chestnut Well Done Son running into and colliding with the fallen Holistic Remedy and crashing to the dirt, as well…then the dark bay gelding Say Hay By Way having to swerve out to avoid the fallen horses. Both horses scrambling, I’m certain, to get to their feet…just picture that. We acknowledge it. Apologists and racing insiders would rather not discuss it. Sweep the damaged and dead “under the rug”. Sue Stover, veterinarian and researcher at the University of California-Davis; “We know that well over 85% of horses that die from a bone fracture die because the bone has a weakness [pre-existing injury].” Yes, it’s quite obvious why the apologists would rather be tight-lipped about their dead horses. R.I.P. Holistic Remedy and Well Done Son. (1) “As a result of casino-market saturation, however, the sport of racing and it’s key players are grappling with a loss revenue in some states. 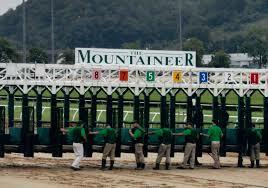 Sharp drop-offs in the flow of casino funds to racing in West Virginia and Delaware exposed the sport’s reliance on these infusions as it struggles to find a new generation of fans”. (2) “Former Charles Town jockey, Larry Reynolds, who benefited when slots rejuvenated the track in the late 1990s, quit the business this year to work for a cable company. I’m hoping there’s a future in racing, but unfortunately the writing is on the wall and it doesn’t look promising, he said”. I do believe “the writing is on the wall” for racing. Of course it will take a while. The start of racing’s demise will be in the closure of tracks such as Charles Town and Mountaineer. Others will follow. There will be a drop in breeding. It will all take time to happen. Some have said it will be the end of the Thoroughbred. I doubt that will be the case because the Thoroughbred is a beautiful versatile horse and they will still be bred, but in significantly less numbers. Currently the horse is underappreciated and suffers greatly at tracks before dying at a young age in racing or in slaughterhouses. Overbreeding is hurting the horse. When they are less in number, the breed will be more appreciated because, as the saying goes, “what’s seldom seen is wonderful”. they spent 20 million on ‘capital improvements’ wonder where that money came from ????? Meanwhile, race horses are getting injured and dying across the country. What a tragedy horse racing is. Laurel Park is all spruced up with $20 million in capital improvements and ready to host Saturday’s 30th running of the Maryland Million, named in honor of Jim McKay, the late sportscaster and longtime host of ABCs “Wide World of Sports” who conceived the idea for a day that Marylanders would celebrate their love of Thoroughbred racing. It’s a competitive 11-race program with stakes races in numerous divisions for horses sired by Maryland stallions. Thank you for sharing that article, Rose. The writing IS on the wall for racing – absolutely it is! I was very much interested in a comment by a racing supporter who offers his thoughts frequently on the Paulick Report; “Fans don’t keep tracks alive..gamblers do..if a small track doesn’t have slots these days they will need some gimmick to stay afloat.” Exactly. Sink, racing…SINK. A quick Google search shows he was scratched by the veterinarian on July 12, 2015. Thank you, Mary – yes, Holistic Remedy most likely had a pre-existing injury before his fatal breakdown. Dr. Sue Stover, through her research, has found that “well over 85% of horses that die from a bone fracture die because the bone has a weakness” (“repetitive overuse injuries”).